June 9, 2008 — The spring rally of the Workhorse Chassis Motor Home Club (WCMC) set a new attendance record for Workhorse club rallies with 84 family units on the scene for fun and education April 15 to 19. 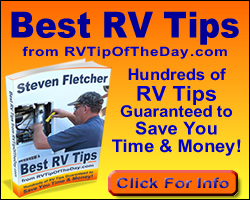 The event at the Beaudry RV Resort and Rally Park in Tucson, drew a great number of first-time attendees. "I would bet this was the first rally for nearly half of them," said Club President Ed Gray. "A lot of people in the last six months have joined the club specifically so they could attend this rally," said Gray. The 400-site resort at Beaudry RV includes campsite patios with wrought iron furniture and other resort amenities. Also, the Workhorse seminars are a big draw, said Gray. Seminars by Workhorse personnel, Redlands Truck and RV Performance Center of Redlands, Calif., Alcoa Wheels and Michelin Tires were well attended. Kongsberg Automotive, a supplier for Workhorse's WISE™ multiplexing system and adjustable pedals, made its first appearance at a WCMC rally. Kongsberg representatives explained their work and current advancements in chassis technology. Rally goers were also among the first to see the new Winnebago model built on the Workhorse UFO™ rear engine gas chassis — the Adventurer Limited, which was supplied by nearby La Mesa RV and purchased at the rally by one of the club members. Ride and drives on a Winnebago Destination demo coach built on the Workhorse UFO chassis were conducted over two of the days. In official business, Ed Hessemer was named the club's new Vice President for Rallies — West. He replaces outgoing Vice President Dan Moynahan. Moynahan and his wife Sue were the rally masters. The club, which is a chapter of FMCA, also heard from Jay Blumenthal, president of INTO (International) Area of FMCA, who updated members about FMCA benefits. Fall Rally Club members are now looking forward to the fall rally in Myrtle Beach, S.C. The "Sun and Surf Rally" will be Oct. 6 to 10 at the Ocean Lakes Family Campground. Registration is open, and club members will receive registration forms in the mail. Those interested should watch the WCMC website at www.wcmc.workhorse.com for more details. They may also contact rally masters Mike and Colleen Pelchat at 843-397-4708 or colleen546@aol.com or mpelchat@irv2.com. At FMCA Convention Workhorse also will have a substantial presence at the FMCA 80th International Convention July 14 to 17 at the Minnesota State Fairgrounds, St. Paul, Minn. All Workhorse owners are invited to attend the Workhorse Chassis Motor Home Club Social Hour from 5 p.m. to 6:30 p.m. Wednesday, July 16, in Seminar Building No. 5 (Modern Living Building). Workhorse personnel will exhibit a UFO chassis and a W24 platform in Booth No. 2904 in the outside exhibit area. Robert Zulian will conduct a service seminar in Seminar Building No. 3 (the Sheep & Poultry Building) from 9:45 to 11 .m. Wednesday, June 16. Workhorse Custom Chassis Workhorse Custom Chassis is ISO 9001 certified and a leader in the manufacture of chassis for motor homes, walk-in trucks and buses. It is a wholly owned subsidiary of Navistar International Corporation (Pink Sheets: NAV). For additional information call 877-294-6773 or visit www.workhorse.com. Navistar International Corporation is one of the world’s leading transportation equipment manufacturers. In addition to Workhorse, the company produces International® brand commercial trucks, MaxxForce™ diesel engines and IC Corporation school and commercial buses and is a private label designer and manufacturer of diesel engines for the pickup truck, van and SUV markets. The company is also a provider of truck and diesel engine parts and service sold under the name Navistar Parts®. Navistar Financial®, a wholly owned subsidiary, offers financing services. Additional information is available at www.navistar.com.